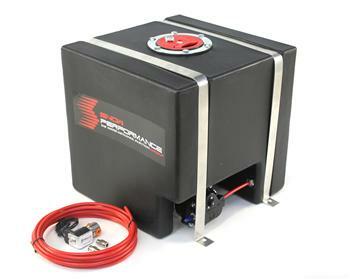 Snow Performance Reservoir UNIVERSAL - Dezod Motorsports Inc - Home of the automotive performance enthusiast since 2002. The Snow Performance 2 Quart Reservoir is perfect for drivers that need a little extra juice, or want to replace the reservoir included with Snow Performance Boost Cooler Kits. Only 7”wx5”hx4”l this reservoir can be mounted virtually anywhere. The Snow Performance 7 Quart Reservoir gives much more range than the included 2 qt tanks, and is fairly small in size – 10”l x 12”h x 7”w (similar to a very small car battery) and includes an additional 10 feet of hose. The 8 gallon reservoir is used mainly for diesel trucks and gives a range of 5-600 miles when towing around 12,000 lbs. It comes with a mounting bracket, an extra 10 ft of hose and a shut-off solenoid to prevent gravity feeding if you ever park on a steep incline. Measurements: 16”l x 17”h x 13”w. This size allows it to mount inside of most bed-mount tool boxes. NOTE It is recommended that a Solenoid Upgrade (part #40060) be used in any application that utilizes a trunk mounted reservoir.